The first connection is the concept of … the flushable toilet: at a gathering in Wardour Castle before October 1594 the flush, “was first thought of and discoursed of, with as brode termes as any belongs to it, in presence of sixe persons”. This information comes from a godson of Queen Elizabeth, Sir John Harington, who was present on that occasion and later wrote, A New Discourse of a Stale Subject, called the Metamorphosis of Ajax (1596). Ajax is a pun on the term jakes, slang for toilet (still used in Ireland). What was Wardour like in Harington’s time? 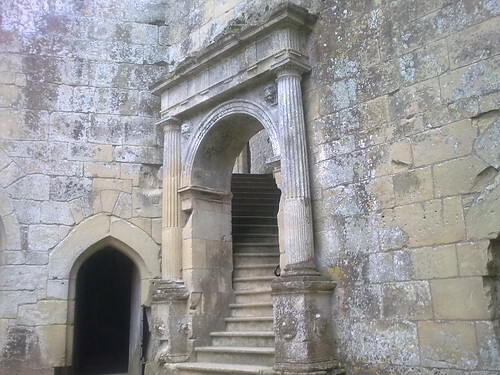 On the right is a classical doorway, with curved staircase, added to the inner courtyard in the 1570s. 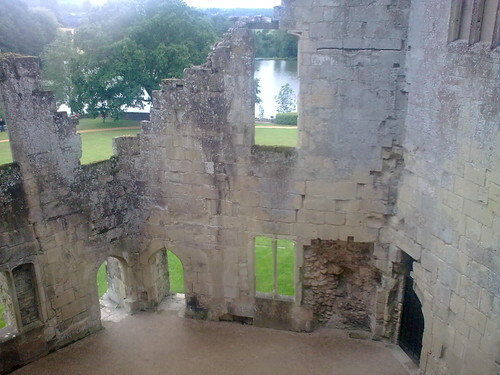 Below left is the inner courtyard seen from above that doorway. This was the heart of the castle – the geometric centre of the hexagon – and completely enclosed (bear in mind the grass outside grows on the foundations of the destroyed wings). Imagine how busy this place was: people gathering around the fountain to exchange gossip from all over the castle, voices calling down from the windows above. The castle signified a ferocious confiscation of wealth, but I reckon this courtyard was a place for ordinary people. The second connection is a theme woven into the history of the castle under the Tudors – fascinating because of the connection back to Harington and those “sixe persons” who gathered at Wardour. The castle estate had been purchased by Thomas Arundell of Lanherne in 1547 – an example of the great redistribution of wealth to those who supported the reformation under Henry VIII. But that doesn’t convey the full truth. Was Arundell a Tudor arriviste? Yes and No – he came from old aristocracy in Cornwall, was related to two of the king’s wives (Boleyn and Howard), and enjoyed the patronage of Wolsey. Surely he was a protestant? Surely not, and it didn’t take long for trouble to catch up with him. Upon the coronation of Edward VI his religious allegiance was called into question, and in 1552 he was put to death for treason. The estate was confiscated by the Crown, but soon restored to the family. Cutaway of the castle, as remodelled. By Stephen Conlin. The succession to the estate makes it more interesting: in 1570 Arundell’s son, Matthew, acquired the castle and remodelled it: “Doorways were redesigned and windows enlarged to let in more light; a new gallery was added and the house was decorated and furnished to a very high standard”. The classical example in the picture above is significant because it betrays the influence of the counter-reformation. Not convinced? The subject is obscure and a bit deep, but the excerpt below flushes Wardour right into this conflict of civilisations – Harington and the Catholic Arundells swirling in a bowl of religious persecution. The first major collection of marginalia comes at the end of the first part, ‘The Metamorphosis of Ajax’, where Harington has added in the margin of Lord Lumley’s copy a list of persons present when ‘the devise was first both thought of and discoursed of’ … They are ‘Erl of Southampton, Sr Mat. Arundel, Count Arundel, La Mary Arundel, Sir Henry Davers’; the place is glossed as ‘Warder Castle’ described as ‘so seated without as England in few places affords more pleasures’ … The setting is suspiciously Catholic; Sir Matthew Arundell was a leading recusant; his son, Thomas, who was at Eton with Harington, was out of favour with the Queen because of the title – Count of the Holy Roman Empire – he had recently received from the Emperor Rudolf. Lady Mary Arundell was the devoutly Catholic sister of the Earl of Southampton. The suspicion that the insider circle was a recusant one is increased when, in ‘An Apollogie’, Harington comes to the jury he is impanelling to judge the value of his book. The four nobles are glossed by Harington in the margin as follows: ‘The Earle of Northumb., The Viscount Montacute, The Earle of Worcester, The Lord Lumley’. A fifth, ‘The Earle of Essex’, is glossed as not being likely to be ‘intra quatuor maria’ [within the four seas] … These four nobles were not only, as Scott-Warrens argues, ‘known, or suspected, to be Catholic’: they were the leaders of the Catholic community in England. I promised to show how difficult it is to get to this place: not by rail or by bus – you have to go by car. It’s about 15 miles west of Salisbury in the county of Wiltshire, but backwards in time and sufficiently remote that satnav will only get you so far. All I could see was greenery, and the road was so narrow I wondered if I should turn back. Then an unexpected hotspot of activity, outside a church fete, where dozens of cars were parked on the verge, forcing the traffic to pull over and let people through. A roadsign told me this was Wardour, but nothing to show the castle’s location. I took the most likely turn and headed up a hill for about a mile, creeping over potholes under an endless canopy of trees. The top of the castle peeped through the leaves, then a grassy field … and I found the place surprisingly busy. There was even a shop for visitors – the sign said, “one day open, next day not”. Wardour Castle is a truly historical spot, but also full of pleasures. There is a beautiful view from the castle turrets, over a pond and down the valley to the classical house. And whether or not you identify the room where Harington had his eureka moment about (on?) the flushing toilet, you at least get to observe the English in their natural habitat: sat on deckchairs outside their polished campervans, gazing over the lush countryside as they feast on egg sandwiches, washed down with milky tea. Okay – that part may be not so beautiful, but this is England. I recommend. * Gerald Kilroy, Edmund Campion: Memory and Transcription (2005), p.5. I haven’t read this book, but it looks very interesting … and pricey. For visitor information here’s the English heritage site. Cheers! Or is that spam? Should know by now.